One of the cool things we get to do at Caliber is sort through reams of data on public perceptions of hundreds of companies, and look for interesting insights and patterns. A few weeks ago, after compiling our reputation ranking of the DAX 30 companies in Germany, we did just that – and found an interesting insight we wanted to share with the world. The primary metric we measured was our standard Trust & Like Score, which indicates to what extent people trust and like the company, and on the basis of which we typically rank companies. This produced the DAX 30 ranking with some predictable results, like Adidas and Siemens being the most trusted and liked, while Vonovia and Deutsche Bank being the least so. So far so good. 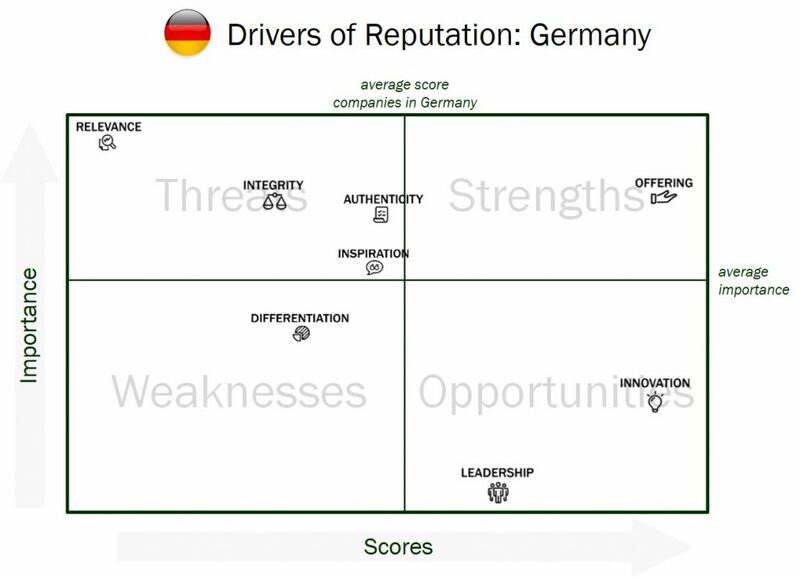 What piqued our interest more was the analysis of what actually drives people’s trust and affection in Germany. We often measure rational perceptions as well – things like people’s sense of a company’s products, integrity, differentiation and more – that are shown to be drivers of such feelings of trust and affection towards companies (also referred to as reputation drivers). Once we calculate the scores people give companies on those “rational” dimensions, we calculate a statistical driver analysis that measures how important people consider them to be. In other words, a driver analysis tells us which rational perception drives companies’ reputations the most, and here is where we got surprised. For many companies, it’s their perceived product quality or responsible behavior that drives the extent to which they are liked and trusted. This also holds true in Germany, where the second biggest reputation driver on average is what we call “Offering” (perceptions of compelling products and services). But an even bigger driver in Germany is “Relevance”, and that’s more unusual. The scores on Relevance reflect respondents’ answer to the question: “to what extent can you relate to what this company stands for?”. The fact that this dimension is the biggest reputation driver in Germany means that most of all, people in Germany expect companies to stand for something they can relate to – more than they expect them to have good products, behave responsibly, be innovative or be differentiated. This is unusual compared to what we see in other markets, and therefore interesting. What’s even more interesting is that when we look at the scores given by Germans to the DAX 30 companies on this Relevance dimension – we see that they are the lowest of all scores given on all other rational dimensions. So while Germans expect their companies to stand for something – companies seem to fail in delivering on that expectation. Again this is unusual, as we typically see companies delivering on main expectations, i.e. scoring above average on the most important dimension. 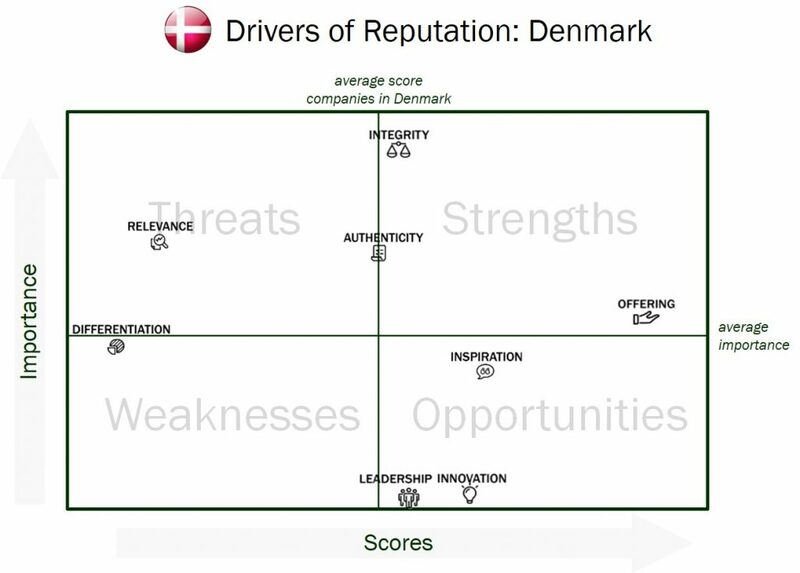 You can see this for example in a similar comparison of scores and importance of reputation drivers in Denmark, where we measure similar metrics for the country’s 100 most prominent companies. So Germans want their largest companies to stand for something, and currently feel they don’t. Why is that the case? And what does it mean? Is it just the old stereotypical “grumpy” nature of the Germans? Well they do seem to be relatively untrusting in business, as the most recent Edelman Trust Barometer shows (according to which only 44% of Germans trust Business in general, compared to 48% in the US and 54% in Italy), and the average Trust & Like Score we measured for the leading companies in Germany was 70,8 compared to 72,2 in the United Kingdom and 75,7 in Denmark for example. But that still does not explain the particular expectations, and disappointment, around Relevance. One possible explanation is that in a country where product quality traditionally reigned supreme and was the source or national pride and differentiation – companies have perhaps been slower than in other markets to adapt to a different reality; one in which people want to see a higher purpose beyond a good product, and society expects business to help solve human, rather than just technical, problems. 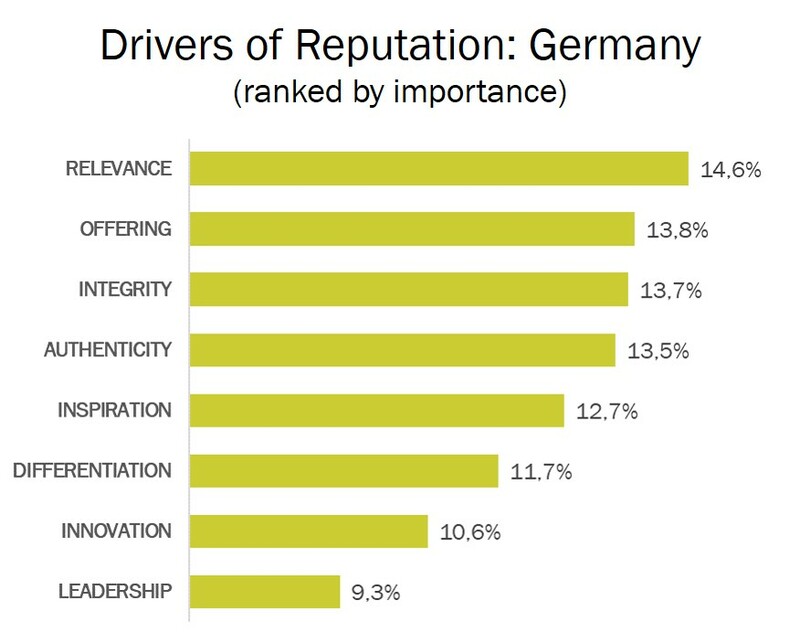 Indeed, another survey recently found that German companies still tend to be “egocentric” in their brand positioning, talking about products rather than the greater needs of the public. This all may sound like an academic problem but in fact it has very concrete consequences: trust and affection towards companies repeatedly prove to lead to behavior such as buying their products and services, recommending them, advocating on their behalf and forgiving them for the occasional misbehavior. This means that if German companies keep failing at articulating their reason for being, their purpose beyond the actual products (and money) they make – they will start losing customers, advocates and ambassadors. Companies in other Western markets have started on that journey long ago – perhaps it’s time for the German icons to join them?